Haylee Ellis with one of the APOPO HeroRATs. Photo: APOPO. Animal behaviour and welfare researcher Haylee Ellis has recently returned to New Zealand after spending two-and-a-half years at the non-governmental organisation of APOPO – which stands for Anti-Persoonsmijnen Ontmijnende Product Ontwikkeling or Anti-Personnel Landmines Detection Product Development in English. APOPO is responsible for the training and deployment of HeroRATs, an army of giant African pouched rats, which are highly trained to sniff out undetonated landmines, and the presence of TB in sputum samples. 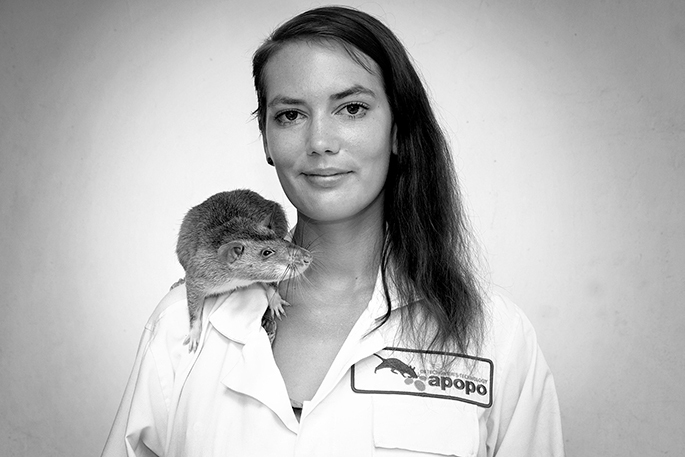 Haylee’s work training rats at APOPO is being written up as her thesis for her PhD. Haylee, a Waikato University Bachelor of Psychology student, has studied animal behaviour throughout her long academic career which includes training as a vet nurse after her degree, and then Honours and Master’s degrees back at Waikato. Her choices of study were inspired by the work of the revered American professor of animal science, and autism spokesperson, Temple Grandin. Haylee was lucky enough to meet her hero in person, and describes herself as being “quite flustered” by the occasion. The opportunity to go to East Africa arose through Haylee’s connections at Waikato University. She lived at the APOPO Research and Training Headquarters in Morogoro, Tanzania. In this quite isolated but very friendly African town, she was introduced to the lovable HeroRATs (Cricetomys gambianus). “They are bred at the centre specially to be trained for landmine and TB detection,” says Haylee. At four weeks old, the baby rats are weaned and move into the care of humans. They are handled and socialised at first, and their full training takes around nine months. The rats are extremely well cared for, living in large clean kennels, receiving an excellent diet, regular exercise, weekly veterinary care and an onsite animal behaviouralist, and plenty of personal attention and playtime. They are retired when too old to work, and are never euthanised. They also only work for short periods as they are affected by the heat. Minefield detection HeroRATs are trained to sniff out TNT (trinitrotoluene). The rats soon learn that the scent of TNT is associated with getting banana, so they can be quickly trained to identify TNT from other substances to get their reward. This progresses to utilising another natural rat behaviour of scratching the ground when TNT is smelt buried under soil, and a specialist team moves in to safely detonate the identified land mine. Fully trained rats work with handlers in cordoned off areas that have not been cleared of suspected landmines. They are too light to set off landmines and very fast to detect the TNT in them, so are therefore the perfect “tool” to speed up detection and clearance, in conjunction with other methods such as metal detectors, says Haylee. There is then a process where the land is returned to the locals. “We have not lost any rats out in the field,” Haylee is quick to point out. Sixty-one countries and states throughout the world suffer from the legacy of landmines buried during times of conflict. They are a barrier to development, constraining communities and denying access to fertile land, travel routes and basic needs. Every year thousands of innocent adults and children are maimed or killed when they accidentally detonate a buried landmine. “APOPO has sent mine action teams to eight countries so far, and are currently operational in Angola, Cambodia and Mozambique,” says Haylee. There are about 10 million new global cases of TB (tuberculosis) per year, with around 1.7 million people dying from the disease. It is now the world’s leading cause of death from an infectious disease. In most sub-Saharan African countries, only about half the patients with active TB are diagnosed. TB containing sputum has a distinct smell that rats can be trained to identify. Before humans and rats are exposed to TB containing samples, the samples are made safe using heat treatment. Using the same training methods for TNT detection, the rats will identify TB positive samples for their banana reward. All rat-positive samples are confirmed in APOPO’s lab using World Health Organisation-endorsed methods. Results are back to the clinics within 24 hours so infected patients can start immediate treatment. APOPO’s TB detection research indicates that partner clinic detection rates are being raised by 40 per cent. Using HeroRATs for TB detection is happening in Tanzania, Ethiopia and Mozambique. Haylee is proud to have been part of such a successful NGO that is making such measurable differences in the world, and their work is well received at conferences. Now she’s concentrating on her thesis and is on her way to becoming Dr Haylee Ellis, while also considering whether to find a job or do further research overseas in another area of animal behaviour. Meanwhile the HeroRATs of East Africa continue to save human lives on a daily basis.